future commitments to reduce greenhouse gas emissions are likely to be among the most contentious issues at the eighth climate conference of parties (cop-8) to be held later this month in New Delhi. Several industrialised countries, including Denmark, Canada, Japan, Norway and the uk have indicated that they want to raise this topic at cop-8. 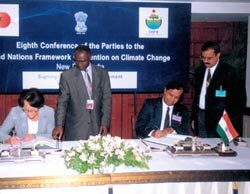 However, at a recent informal meeting in New Delhi to discuss the agenda of the high-level segment of the conference, developing countries were categorical that they wanted to limit talks to the implementation of industrialised countries' existing commitments under the Kyoto Protocol. Developing countries do not want the subject of future commitments -- particularly their own -- raked up because there is no evidence that industrialised nations have met their Kyoto commitments. Instead, they would like cop-8 to review the adequacy of industrialised country commitments in dealing with global warming. Estimates of total emissions reductions that will be achieved by the Kyoto Protocol without the us on board vary. But the actual decrease in industrialised country emissions by 2010 could be as little as 0.01 per cent if loopholes provided in the protocol are exploited. Such a small reduction will have no significant impact on climate change mitigation. Despite the fact that the United Nations Framework Convention on Climate Change (unfccc) called for such a review of 'adequacy of commitments' during the fourth conference of parties in 1998, any discussion on the issue has been constantly postponed. At the recent New Delhi consultation, the Indian government put forward an informal paper that prioritised a discussion on ways and means to help developing countries adapt to current as well as future climatic changes. Despite the establishment of three funding mechanisms, hardly any financial or technological aid has been forthcoming from industrialised nations to help developing countries with acclimatisation. While some international groups feel that the issue has been long ignored due to the global focus on mitigation of climate change, others view the Indian government's emphasis on adaptation as a way of diverting attention from developing country commitments. cop-8 will also discuss, and possibly adopt, rules for forest-based emission reduction projects under the Clean Development Mechanism (cdm). Under cdm rules, industrialised countries can invest in reforestation and afforestation projects in developing countries and get carbon credits in return. Forest conservation does not qualify for credits. Developing countries such as Indonesia opposed such an inclusion, since it could mean pressure from the industrialised world on heavily forested nations to protect their forests. However, there are still several unaddressed problems associated with the use of forests to absorb carbon dioxide emissions. For developing countries like India, a key issue is the social impact of such projects on local communities which depend on the forest for their food, energy and housing needs. Unless there are clear rules to ensure that benefits of forestation projects percolate down to these groups, profits from such ventures could well go entirely to large-scale industry plantations. There is also the issue of permanence. Even as planting trees may sequester carbon dioxide , there is no guarantee that these trees will survive and retain it. Moreover, efforts at reforestation or afforestation in one area may displace communities. Consequently, these people could be forced to move to another forested area and clear it. In such a scenario, carbon offset by the afforestation project is released by deforestation elsewhere. It remains to be seen if cop-8 is able to come up with comprehensive solutions to such problems. The meeting will consider a proposal from Canada, claiming emission allowances for 70 million tonnes of carbon dioxide equivalent per year for exporting cleaner energy to the us. This is seen as an attempt by Canada to get maximum mileage out of the fact that its ratification is essential for the Kyoto Protocol to come into effect. Ever since the us walked out of the Kyoto Protocol, climate negotiations have remained cordial. The us has attended negotiations as party to the unfccc, but had very little to say. The eu and g-77 have, meanwhile, focused on enforcement of the Kyoto Protocol despite the us' exit. With both Canada and Russia indicating that they are likely to ratify the pact, this does seem likely in the near future. But the absence of the us -- responsible for a fourth of the world's carbon dioxide emissions -- is likely to pose a serious problem. Despite speculation that September 11 would make the us veer towards multilateralism and the Kyoto Protocol, there are no indications of this happening so far.